It wasn’t long ago that Bergstein’s Deli reigned as the darling of Hyde Park’s food trucks. Students familiar with the corner of Ellis Avenue and East 57th Street probably remember the chaotic scene of lunchgoers vying for a spot in line. At least I certainly do. Each week, throngs of students flocked to the blue van, attracted by the dated music and smell of cured meats. For many, the deli crowds were just a mild obstacle while speed-walking to class, but for those interested in seeing what the truck had to offer, it could be a bit more complicated. The first time I tried to eat at Bergstein’s the line snaked down past the next truck over, and a woman trying to grab her order shoved me off the sidewalk. Animals. I did eventually have the chance to eat at Bergstein’s—several times, in fact—before it vanished in January of last year. It was a heavy loss. What made Bergstein’s NY Delicatessen unique—so different from the rest of the pack—was its overall simplicity. While other food ventures focused on one-upping each other with garlic aioli mayonnaise and truffle-infused fries, Bergstein’s was serving corned beef and pastrami on rye, served with a side of homemade potato chips. Solid food with a sheer lack of pretension in a homey and quaint truck that was more familiar and distinctive with each visit: That’s what Bergstein’s brought to the table. So it was that the disappearance of that beloved truck from the neighborhood was heartbreaking, and the deli’s eventual return to Hyde Park uplifting. Bergstein’s was too good not to come back to Hyde Park. Not only did it have a tried-and-true business model that must have pleased the University administration, but here also was a restaurant whose success was all but guaranteed. The lines on Ellis were tangible evidence of this. The new East 55th Street Bergstein’s NY will finish its soft opening on February 10, expanding hours to 8 p.m. and extending the limited menu to include all the classic sandwiches from the original Chicago Heights location. There is no doubt that Bergstein’s is here to stay, but how does the restaurant fare when compared to its mobile counterpart? Entering and ordering might be the toughest part of Bergstein’s to swallow. The current ordering process looks like an inefficient factory line: fill out your order, hand it to the people behind the counter, and watch as it ever so slowly makes its way down the line. Should I sit down while I wait, maybe a grab a soft drink before paying? It’s all rather unclear. In the meantime, you’ll be forced to absorb the atmosphere of the place. What strikes you immediately is the sterile, tacky interior that lacks any of the hominess of the neighborhood deli we imagine. This part of the restaurant can only improve with age, but would it kill them to include more lights? Despite the strange interior appearance, the restaurant always seems too busy, even when it’s not. Maybe it has to do with the long counter line, or the disproportionate number of employees in the back. Either way, the place is happening. Once you grab a seat—my favorite place to be is at the window counter looking out onto East 55th Street—you can be fully acquainted with your sandwich. On my first visit I had the Second City, a deceptively compressed creation on a fluffy pretzel roll. The salami and turkey are densely packed in, allowing the flavors of the meat to sing through despite the sharp Muenster in the background. It’s a solid first-time pick. But the magnum opus here is the Bensonhurst, a sandwich of David and Goliath–like proportions. The sandwich is a combined layering of pastrami and corned beef covered in melted Swiss on two slices of rye bread. Bergstein’s uses the same meats as the legendary Manny’s in the South Loop, but their inclusion of the cheese and having it packed so tightly together is brilliant. Some might be dismayed that it’s too little for the price, but the sandwich satisfies in ways invisible to the naked eye. Of the sandwiches, the only one I felt disappointed with was the Reuben. It needs more sauerkraut and Thousand Island. But in the category of sides I was a bit miffed. Instead of the homemade potato chips that the food truck—in all its glorious blue splendor—served, at the Hyde Park location, you have the option of Lay’s or Kettle Chips. To those who previously enjoyed the greasy and crunchy goodness of their chips, I am sorry to report that they are not there now. I’m still holding out that they may come back. Since its opening, I have eaten at Bergstein’s four times, and maybe for some that will be enough tries for the school year. There is no doubt, however, that I will be back to Bergstein’s, and sooner rather than later. They are now the definitive kings of the Hyde Park meat market, and I’m still dying to try their SoVo (corned beef and chopped liver on rye) and Double Down (pastrami and turkey pastrami with lettuce and tomato on rye). There are things about Bergstein’s that could use some work: the decor, the sides, and the prices (depending on what you get). But there is just something beautiful about corned beef when it’s handed to you boldly and without any fanfare on a slice of the bread of your choice. 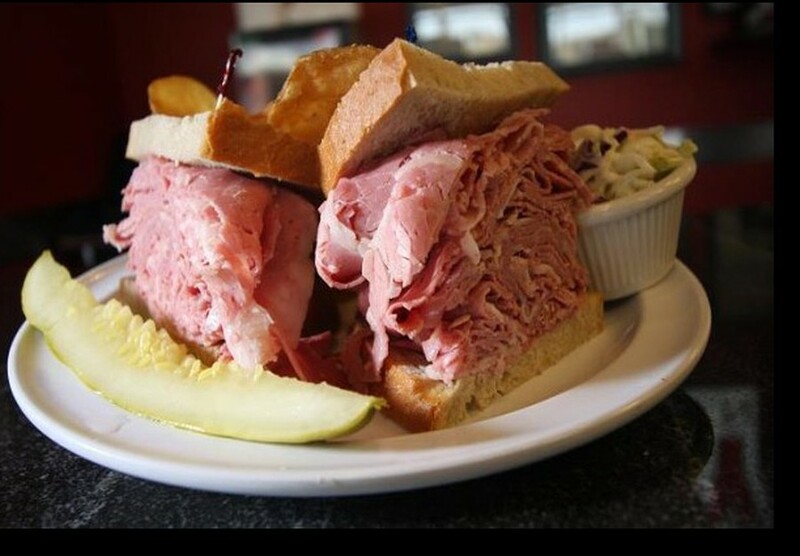 This place may not be the 60-some-year-old Manny’s, but it’s Hyde Park’s deli of choice. Bergsteins's NY Delicatessen, located on 1164 East 55th Street, has an average price of $10 per sandwich.